More fallout from the iOS 6 Maps fiasco is reportedly going down: Apple is said to have fired the manager in charge of its native navigation software. The report comes from Bloomberg, which got its information from unnamed sources familiar with the situation. Apple Senior Vice President Eddy Cue reportedly fired Richard Williamson, head of the mapping team, in an effort to regain user trust after the shoddy Maps system was launched in September. Cue took over both Siri and Maps after an Oct. 29 announcement that iOS chief Scott Forstall would leave the company next year. According to Bloomberg, Cue is looking for help from mapping-technology experts outside of Apple while pressing TomTom to rectify issues in the landmark and navigation data it shares with the company to get Maps going in the right direction. Williamson's firing is a sign that Apple is serious about fixing the issues that have left users lost (literally) and missing Google Maps while humiliating what many consider the top tech company in the world. Apple CEO Tim Cook issued a public apology Sept. 28 admitting that Maps was inadequate and urging people to turn to competing apps until Apple Maps improves. One of Bloomberg's sources reported that Cue is looking to establish new leaders for the Maps group, though a replacement for Williamson wasn't immediately known. 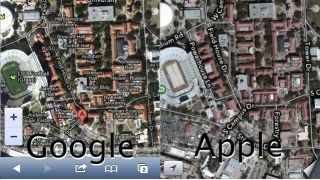 Another source said that a team at Apple has been working to fix errors in Maps, particularly its most egregious gaffs. TechRadar asked Apple for comment and will update this story if and when the company responds.